Billions of cells die during a heart attack. Regenerative medicine could bring them back. The human body has an extraordinary capacity to heal itself: livers can regenerate when damaged, one kidney can learn to do the job of two, and our skin is constantly working to protect us from scratches and cuts that could expose us to harmful pathogens. One of our most vital organs, however, can’t heal quite so well. When our hearts are damaged — by disease or injury — the tissue can’t regenerate very well, or very fast. After a major heart attack, for instance, billions of heart muscle cells may be lost forever. This loss weakens the heart and often ends up leading to conditions like congestive heart failure, or scar tissue build-up, which can be fatal. Currently, the only option for a patient with a damaged or diseased heart is receiving a heart transplant. Donor hearts have to come from people who had healthy hearts before they died — which usually means patients who were fairly young and died in accidents, or from injuries or illnesses that didn’t affect their heart. Patients who are waiting for a donor match to receive a transplant can be waiting a very long time. At the time of publication, there were nearly 4,000 people in the U.S. waiting for a heart, according to the Organ Procurement and Transplantation Network. Some of them will die on the waitlist before a match can be found. But a team of researchers at the University of Cambridge’s Stem Cell Institute in the U.K. is developing an innovative way to repair heart tissue. The team’s solution doesn’t require a donor heart at all — instead, they’ve used stem cells to grow live patches of heart muscle in the lab. These patches are just 2.5 square centimeters (0.5 square inches) but could potentially be a powerful tool to treat patients with heart failure. 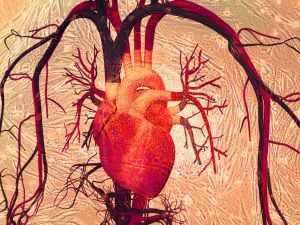 While researchers have tried to inject stem cells directly into damaged heart tissue in the past, the technique didn’t prove particularly effective — mostly because the stem cells wind up getting lost in the bloodstream instead of staying in the heart muscle, where they’re needed. These patches, on the other hand, are live, beating heart tissue that can be affixed to the organ like a scaffold. And, unlike a donor heart, a patient in need wouldn’t have to wait for a match to be found. Instead, the patches could be grown as-needed, and on-demand. The scaffolding tissue will also be grown from the patient’s own cells — eliminating the need for a lifetime of immunosuppressants drugs and lowering the risk of organ rejection, two problems that transplant patients typically face. Eventually, the University of Cambridge team hopes that the custom-made heart patch could be 3D-printed to perfectly fit the area of damaged muscle, then sewn onto the organ by a surgeon — while still an invasive procedure, one that much less involved than a total heart transplant. The biggest obstacle to that procedure will be ensuring that the electrical impulses that make the heart beat can be fully integrated with the patch. Sinha’s team is close to getting their stem cell patches approved for animal trials. If the patches pass with flying colors, they could be ready for human clinical trials within five years.